UNC Greensboro’s “The 60s: Exploring the Limits” series is drawing to a close, with a big event. Dr. Rebecca Adams is nationally recognized for her scholarly work on Deadheads. She first taught a sociology class focusing on Deadheads 30 years ago. The class went into the field, studying Deadhead culture first-hand. What they learned will be a featured part of the conference – as some of these alumni share their stories. Other members of the UNCG community with scholarly interests in the Grateful Dead and Deadheads will also present, as will special guests from North Carolina and beyond – including Amir Bar-Lev, David Gans, and Jesse Jarnow. The panels and discussions during the day will take place in UNCG’s Elliott University Center. These events are open to all, but registration is required. To register, complete the form at alumni.uncg.edu/deadscholarsunite. If you are only able to attend a session or two, please email dead@uncg.edu to reserve a space rather than registering. If you decide to attend a session or even the entire day’s events at the last minute, stop by the registration desk to find out if “miracle tickets” are available. Filming the Grateful Dead and Deadheads. 9:45 a.m.
Report on the UNCG Deadhead Community Project. 11 a.m. The Grateful Dead Legacy. 12 p.m.
Reflections on THE CLASS Thirty Years Later. 12 p.m. Grateful Dead Shows as Rituals. 1:30 p.m.
Photographing the Grateful Dead and Deadheads. 1:30 p.m. Collecting Data on the Dead and Deadheads. 1:30 p.m.
Musical Influences on the Grateful Dead. 2:30 p.m.. Covering the Grateful Dead. 4 p.m. Gender in the Grateful Dead Community. 5 p.m.
From 6 to 8 p.m. enjoy a closing reception for the “Images of the Grateful Dead and Deadheads” exhibition at Tate Street Coffee House, with live music by Jon Walters and David Gans. Admission is free. 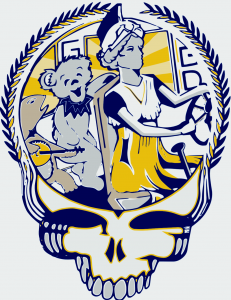 Afterward, UNCG’s Grateful Dead cover band, “Spartans Play Dead,” will take to the Van Dyke Performance Space for a show. Doors open at 8:15 p.m. with the concert starting at 9 p.m. Tickets for the “Spartans Play Dead” concert are $5 and may be purchased in advance at https://thevandyke.org/ or at the door. More details will be posted at the Facebook page and the UNCG CVPA site. Artwork by Lena Dominique Rodriguez-Gillett, UNCG Class of 2018. 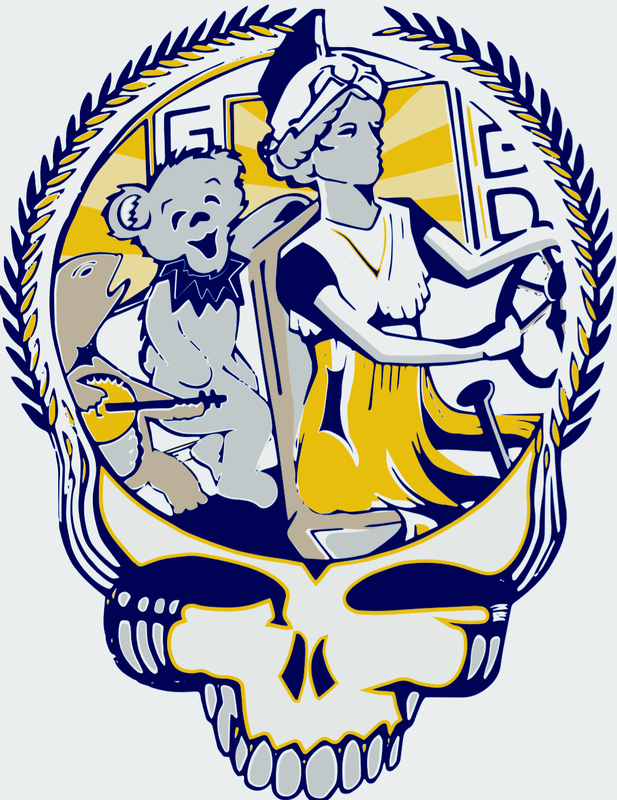 Stealie and other Grateful Dead images used with permission of Rhino records (not to be used on t-shirts or other merchandise). The Golden Chain Honor Society welcomed 38 new members during the Spring 2019 inductions. This diverse student population represents many facets of the university experience. Kelsey is a student athlete on the UNCG Cross Country/Track team. She is a junior double majoring in Biology and Psychology. Michael is a senior majoring in Classical Studies and is a member of the first class of McNair Scholars here at UNCG. Caroline is a senior majoring in Communication Studies. She is also a Senior Managing Consultant in the UNCG Speaking Center. Casey is a senior majoring in Sociology. He is a United States Army National Guard and has served for 8 years, recently helping residents to safety during Hurricane Florence. Jack is a junior majoring in Business Administration. He is a student athlete on the Men’s Tennis Team. Breanna is a junior majoring in Kinesiology and a member of the UNCG Women’s Softball Team. Nicholas is a junior majoring in Sociology. He has dedicated several hours volunteering and mentoring with the Big Brothers, Big Sisters program. Rachel is a senior double majoring in Political Science and Communication Studies. She is also a Communications Consultant in the UNCG Speaking Center. Kendall is a junior majoring in Business Marketing. She is a student athlete on the Women’s Golf Team. Maria is a junior double majoring in International Global Human Rights and Women’s and Gender Studies. She is also a member of the UNCG Women’s Volleyball Team. Marissa is a junior majoring in Psychology and a member of the UNCG Women’s Soccer Team. Brandi is a senior majoring in Studio Arts and minoring in business. She is also student athlete on the Women’s Basketball Team. Nautica is a junior majoring in Kinesiology and a member of the UNCG Cross Country Track Team. Jordan is a junior majoring in Business Administration and a member of the Women’s Softball Team. Mary is a junior majoring in Speech Pathology and a member of the UNCG Women’s Soccer Team. Kate is a senior majoring in Business Administration with a minor in American Sign Language. Matthew is a senior majoring in Business Economics. He is a student athlete on the Men’s Soccer Team. Megan is a junior majoring in Business Marketing and member of the UNCG Women’s Volleyball Team. Taqqi is a senior majoring in Kinesiology. He is a student athlete on the Men’s Basketball Team and a student assistant coach. Jasmine is a Senior majoring in Communication Studies and a member of the Women’s Softball Team. Kellar is a junior majoring in Communication Sciences and Disorders with a minor in American Sign Language. Victoria is a junior majoring in Media Studies. She is an athlete on the Women’s Basketball Team. Ali is junior majoring in Spanish. Next year she will oversee the children’s program at Real World English, which is a two-generation program which helps Latinx parents learn English while their children participate in STEM activities. Cienna is a junior majoring in Supply Chain Management. She is a student athlete on the Women’s Soccer Team. Daniel is a junior majoring in Business Economics. He is a student athlete on the UNCG Cross Country Track Team. Sara is a junior majoring in International Business and is a member of the Women’s Golf Team. Nadine is a junior from Egypt majoring in Communication Studies. She is also a student athlete and Captain of the Women’s Basketball Team. Kara is a senior double majoring in Public Health and Communication Studies with a minor in Business Studies. She is a managing consultant in the UNCG Speaking Center. She is also a member of the first Chancellor’s Ambassador’s Class. Kaitlyn is a junior double majoring in Anthropology and Sociology. She is captain of the UNCG Cross Country/Track team and an employee in the Kaplan Center for Wellness. Olivia is a junior double majoring in History and Women’s and Gender Studies. She is a member of the Spartan Orientation Staff and Vice President of the Student Government Association. Crystal is a junior majoring in Business Administration. She is a member of Alpha Lambda Delta Honors Society, and the Lloyd International Honors College. Abigail is a junior majoring in Spanish and Communication Studies. She also volunteers with the UNCG Speaking Center with groups of elementary and middle school students in theatre camps during the summer. Louisa is a junior majoring in Kinesiology and a member of the Women’s Golf Team. She has also served as an Assistant Golf Instructor. Kaley is a junior majoring in Communication Studies. She is a student athlete on the Women’s Soccer Team at UNCG. Heida is a senior majoring in Sociology with a minor in Women’s and Gender Studies. She is a captain on the Women’s Soccer Team and awarded Most Outstanding Player of the SoCon Tournament. Cameron is a junior majoring in Business Administration. He is also a Writing Consultant in the University Writing Center. Ny-Juan is a senior majoring in Kinesiology. He is a student athlete on the UNCG Cross Country/Track team. Riccardo is a junior majoring in International Business. He is also a student athlete on the Men’s Soccer team. 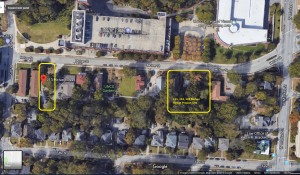 UNC Greensboro is demolishing four vacant residential properties on the east side of McIver Street, located at 111, 113, 115, and 213 McIver Street. Temporary safety fencing will be erected around the sites this week and demolition will begin the following week. All demolition activities are expected to be complete by the end of May. The sidewalk in front of these houses will be temporarily blocked and there will be some periods of noise associated with the demolitions. 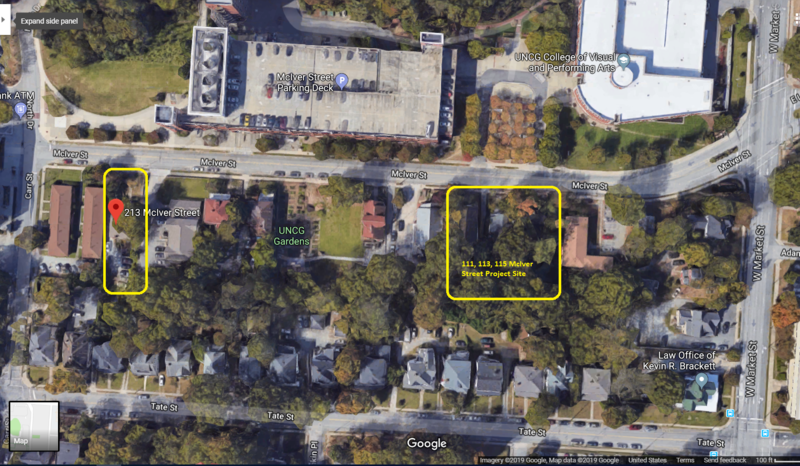 Precautions are being taken to minimize any potential risks to health and safety including signage, air quality monitoring, dust suppression, and coordination with the adjacent UNCG child care facility at 117 McIver Street. Once demolition is complete, the sites will be graded and planted in grass. There are no immediate construction or development plans for these sites. If you have any questions regarding the project, please contact Facilities Design and Construction at 336-334-5684 or uncg_fdc@uncg.edu. If you have any questions related to health or safety, please contact Environmental Health and Safety at 336-334-4357 or safety@uncg.edu. This year, faculty and staff will notice a little something different about our annual awards. In order to give more focus to the incredible work being done across our institution, UNCG will now have two celebrations to honor faculty and staff achievements. On April 17 at 4 p.m. in the EUC Auditorium, Provost Dunn will host our Faculty Awards ceremony, honoring the innovations and accomplishments of our teacher-scholars. This will include celebrating our state, UNC System, and UNCG-specific award winners. This event, as well as a reception afterwards in the Alumni House, is open to everyone on campus. Then, on May 20, we will honor our staff members with our first Staff Appreciation Day. This day will celebrate staff who have received departmental awards, Staff Stars, and Staff Excellence awards from the past year, and honor those who have exhibited devotion to duty and service to the campus community and beyond. Their stories will be shared across the campus community. We invite colleagues to join Chancellor Gilliam and the awardees to a campus-wide celebration that will be held on Monday, May 20, 2:30-4:30 p.m. More details to come! I am pleased to announce that Dr. bruce d. mcclung has accepted the position as Dean of the College of Visual and Performing Arts. 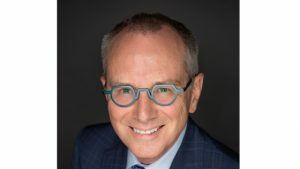 Dr. mcclung will serve as the inaugural dean of the college (first dean hired into the new College of Visual and Performing Arts), following Dr. Peter Alexander’s service as founding dean. As the premier, most comprehensive, and largest set of visual and performing arts programs in North Carolina, the College of Visual and Performing Arts comprises the School of Art, School of Dance, School of Music, and School of Theatre, as well as the Arts Administration program. Dr. mcclung is currently Head of the Division of Composition, Musicology, and Theory at the University of Cincinnati’s College-Conservatory of Music. For two years he served as Interim Dean and Thomas James Kelly Professor of Music also at the College-Conservatory of Music. 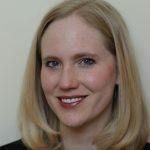 An American music scholar, Dr. mcclung’s book Lady in the Dark: Biography of a Musical from Oxford University Press won an ASCAP Deems Taylor Award, the Kurt Weill Prize, and the Musical Library Association’s George Freedley Award-Special Jury Prize. Last year, his co-edited critical edition of Lady in the Dark was published as part of the Kurt Weill Edition. The Society for American Music presented Dr. mcclung with its Lifetime Service Award also in 2018. At the University of Cincinnati, Dr. mcclung received the Mrs. A. B. “Dolly” Cohen Award for Distinguished Excellence in Teaching and the Graduate School’s Excellence in Doctoral Mentoring Award, and was elected to the Academy of Fellows for Teaching and Learning. Please join me in welcoming bruce to the UNC Greensboro community. He will begin his new role on July 14, 2019. I would also like to express thanks to the search committee for their outstanding work to help us select a new dean. Finally, thanks are due to Dr. Lawrence Jenkens who stepped into the role of interim dean in January of this year. The University of North Carolina Board of Governors has selected Dr. Dianne H.B. Welsh (Bryan School) to receive a 2019 Award for Excellence in Teaching. She will be recognized at the April 17 Faculty Awards ceremony at UNCG, and she will receive the award during the May Commencement ceremony. She is one of 17 award recipients, who represent all 16 of North Carolina’s public universities as well as the North Carolina School of Science and Mathematics. ‘Just get out there and do it.’ This is the demand of Dr. Dianne Welsh, the Hayes Distinguished Professor of Entrepreneurship in the Department of Marketing, Entrepreneurship, Hospitality & Tourism. The sheer number of students and faculty that Dr. Welsh has inspired with this notion is staggering. The idea of practicing and using what she professes to her students resonates throughout her teaching and scholarship. She has spent a career empowering students, faculty, and budding entrepreneurs to engage, explore, take risks, and believe in their own ideas. Through her work, Dr. Welsh champions the interdisciplinary, collaborative work that embodies entrepreneurship. Her students succeed. In her courses, students directly engage business leaders to learn first-hand how the dynamic world of business operates. Through her guidance, students graduate with real world experiences as innovative problem solvers; they start businesses that connect them with their community. As the architect of the Cross-Disciplinary Entrepreneurship Program – a program that consists of over fifty courses in twenty-seven different departments at both the undergraduate and graduate level – Welsh has bridged the campus by facilitating communication, instruction, and engagement across disverse disciplines. Whether it is through her teaching and training students, or mentoring faculty, who have won prestigious Coleman Foundation fellowships to develop novel means of instructing the next generation of entrepreneurs, Welsh has become synonymous with the entrepreneurial movement at UNCG. Welsh received her B.A. in English from the University of Iowa, her M.S. in Psychology from Emporia State University, and her PhD in Business Administration from the University of Nebraska. 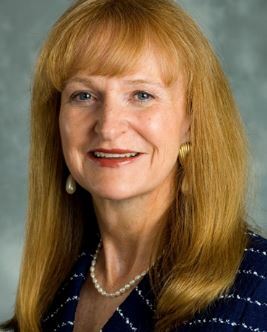 She joined UNCG in 2008 as the Hayes Distinguished Professor of the Marketing, Entrepreneurship, Hospitality, and Tourism in the Bryan School of Business and Economics. You are cordially invited to join Provost and Executive Vice Chancellor Dana Dunn for the 2019 Faculty Awards Ceremony. A cocktail reception will follow the ceremony in the Virginia Dare Room, Alumni House. The Chinese Film Festival, organized by the Chinese Program of the Department of Languages, Literatures and Cultures, is themed youth and love, and will run from Friday, March 29, to Friday April 12, 2019. The Chinese Film Festival series enables the campus community to explore Chinese culture, history and society across a broad range of disciplines, and promotes international cultural exchange.. The Chinese Film Festival is sponsored by the Department of Languages, Literatures and Cultures and the International Programs Center. Today’s Faculty Forum has been canceled to accommodate a Special Meeting of the Faculty Senate. The topic will be the General Education Revision Task Force Report. Today’s (March 20) meeting will be held 3-5 p.m. in Alumni House. In spring 2017, the UNCG Faculty Senate and the UNCG General Education Council approved a call for a task force of UNCG faculty to conduct a self-study of the UNCG General Education Program. The General Education Revision Task Force has been working on a new General Education Plan for UNCG students. Dr. Alice Haddy and Dr. Chuck Bolton serve as co-chairs of the task force. Last summer, the task force designed a variety of model Gen Ed programs to provide examples for the campus community. In the past half year, they have taken part in many Campus Conversions, including three forums, several faculty focus groups, faculty meetings of several schools, three student focus groups and panels, administrative groups and councils, a meeting with Community College partners, and additional outreach. They also received input via a web site survey. The members of the task force and background information may be viewed here. Visuals from Feb. 20 Gen Ed Forum in Alumni House. Text and photos compiled by Mike Harris. I am pleased to announce that Dr. Karen Bull has accepted the position as Dean of UNCG Online. Dr. Bull is currently Associate Dean of Academic Affairs at Syracuse University. 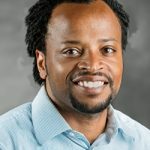 Previous administrative appointments include Interim Associate Dean of Academic Affairs and Online Programs and Manager of Online Programs and Services at Syracuse University. She also served as Director of Program Evaluation and Assistant Director of Distance Learning at Onondaga Community College. Please join me in welcoming Karen to the UNC Greensboro community. She will begin her new role on July 8, 2019. I would also like to express thanks to the search committee for their outstanding work to help us select a new Dean. 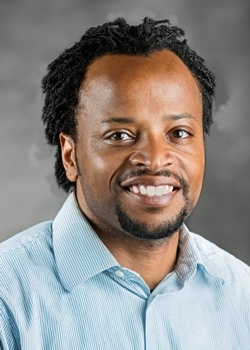 Dr. Armondo Collins (Digital Media Commons) will lead a community discussion on Black Migration at 6 pm, Monday, March 4, at Central Library, 219 N. Church St. Using Zora Neale Hurston’s book, Barracoon: The Story of the Last Black Cargo, Collins will explore race and class in contemporary America. Collins is the head of Digital Media Commons at UNCG. Beverly Burnett, NC Association of Black Storyteller president, will also be in attendance to perform an excerpt from How it Feels to be Colored Me. Burnett is the 2018 recipient of the Zora Neale Hurston Award. Participants will have the opportunity to record their own migration story after the program. These recordings will be permanently archived at the Greensboro History Museum. UNCG has received a $200,000, 1.5 year grant from The Andrew W. Mellon Foundation for a new program that aims to strengthen and transform humanities education and research for students, faculty, and the broader campus and Greensboro communities. Faculty and staff wanting to learn more about this new program are invited to join Chancellor Gilliam and Provost Dana Dunn at a reception this Thursday, Jan. 31, at 3:30 p.m. at Alumni House on campus. Those planning to attend are asked to RSVP via this Google Form. 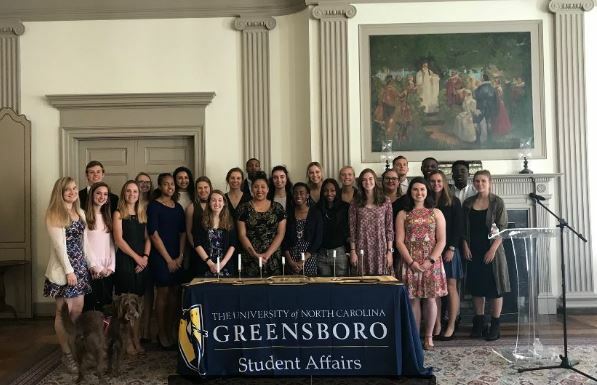 UNCG’s Epsilon Chapter, a recipient of the 2018 “Best Chapter” award at the Phi Beta Kappa Triennial Council in Boston, was established in 1934, and it is responsible for initiating members to the national liberal arts honor society Phi Beta Kappa. Most years at UNCG, circa 50 students are inducted into Phi Beta Kappa. Together with donations and annual dues, the Chapter uses income from the modest endowment to support student membership fees so that no student is ever unable to accept the honor bestowed upon him or her for excelling in a liberal arts degree at UNCG. Funds from the endowment are also used to provide for the annual initiation ceremony held in April. Recognizing the financial contributions of many UNCG faculty and staff over the decades, and particularly honoring the bequest of Dr. Josephine Hege (a member of the UNCG Department of History from 1941 to 1971), the chapter also provides a small number of scholarships to Phi Beta Kappa graduates for travel, enrichment, and graduate study. The chapter discussed and researched possibilities for redirecting their investments during the fall of 2018. Chapter president Dr. Aaron S. Allen (Music and Geography, Environment, and Sustainability) led the initiative. Treasurer Dr. Dora Gicheva (Economics) and webmaster Dr. Stephen Holland (Economics) researched alternatives to the previous investment accounts, which were general and not focused on sustainability or ESG criteria. The Chapter officers discussed the alternatives, decided on the plan with Fidelity, and the membership approved unanimously the Chapter’s move into sustainability investing. Dr. Christoper Hodgkins (English) was at West Point earlier this week, speaking to cadets at the U.S. Military Academy. He co-taught classes on poetry, and spoke to a student group about C.S. Lewis’ “Learning in Wartime.” At noon on Tuesday, he was scheduled to give a talk to cadets titled “Dangerous Poetry: Our Lovers’ Quarrel with Literature and Art.” The talk explores the whys and wherefores of poetry’s problematic persistence, asking why so many have found poetry—and indeed all literature and art—so dangerous, and why nevertheless we can’t seem to live without it. EJ O’Keeffe, a two-time Big South Coach of the Year, has been named the men’s soccer head coach after a national search. The move represents a homecoming for O’Keeffe, who played at UNCG for three seasons, serving as team captain and leading the Spartans to the 2008 Southern Conference championship and NCAA Sweet Sixteen. UNCG will hold an official welcome for O’Keeffe today (Wednesday, Jan. 16) at 12:15 p.m. in Coleman Building, Room 137. It will be streamed via YouTube and the link can be found here. To view the full release, visit uncgspartans.com. The MSI North Carolina Humanities Corridor is hosting a humanities networking event. Currently, the Corridor unites 3 Minority Serving Institutions in North Carolina (UNCG, NCCU, GTCC) and focuses on funding faculty research, students’ high impact experiences, and community-engaged activities. how to meet potential research partners from other institutions. Date and Time: Dec 5, 12pm – 2pm. Location: 2711 Moore Humanities and Research Administration, UNC Greensboro. Please use the Oakland Avenue Parking Deck or Walker Avenue Parking Deck. Both have paid parking. You are invited to join Enrollment Management and the campus community for a farewell event for Dr. Bryan Terry on Tuesday, November 13, between 3 and 5 p.m. in the Admissions tour space, 2nd floor of the Spring Garden Apartments on Spring Garden St. This is a drop-in event with remarks at 3:30 p.m. Nominate faculty, staff and students who have shown outstanding leadership and service for the Gladys Strawn Bullard Award. Potential nominees are those who have gone above and beyond the normal expectations and community involvement of faculty, staff and students. Winners will be granted a $1,000 award. To nominate someone, go to hrs.uncg.edu/Bullard before December 12. The Gladys Strawn Bullard Awards were established in 1981 with an endowed gift honoring the late Mrs. Bullard, an alumna of UNC Greensboro. She was president of the UNCG Alumni Association and a member and Vice Chair of the Board of Trustees. For more information about the award and nomination process, email s_dreier@uncg.edu. Dr. Keith Debbage spoke to Fox8 about attracting millennials to Greensboro. The article. The Sarasota Herald-Tribune wrote an article on UNCG Art’s Sheryl Oring’s art exhibition at Ringling College. The piece. Yes! Weekly featured Dr. Emily Janke’s receipt of the first Barbara A. Holland Scholar-Administrator Award. The piece. 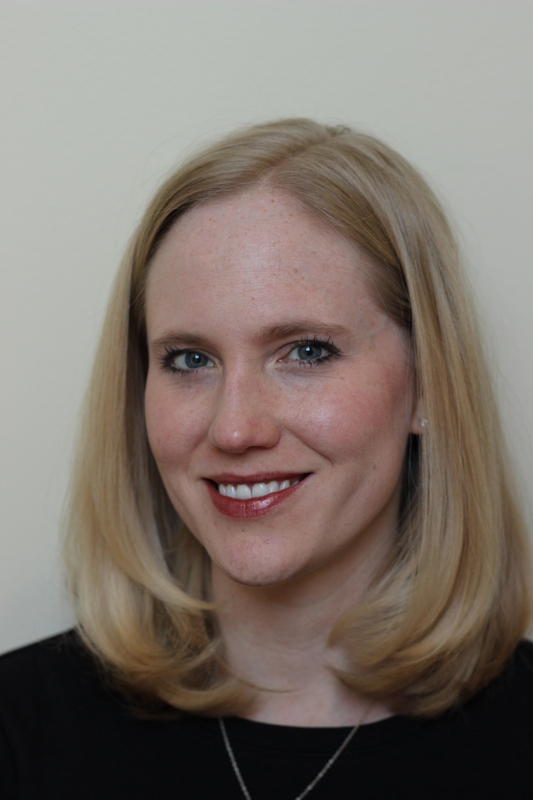 The Washington Post interviewed alumna Kelly Link about her McArthur “Genius” Grant. The News and Record ran that story as well. The article. UNCG Chief Information Security Officer Bryce Porter spoke to WFMY2 for an article on online security. Lee Kinard, alumnus of UNCG and a longtime news anchor for WFMY News 2, died Saturday. “A legend in Piedmont-Triad broadcasting, Kinard began working at WFMY in April 1956 when he was 25. … In his 43 years at WFMY, Kinard helped the CBS affiliate become the Triad’s most-watched news source,” the News and Record reports. He was an outstanding supporter of UNCG. A section of Spring Garden Street, which passes through our campus, is named for him. The Dean of Health and Human Sciences Search Committee and Provost Dunn recently held confidential in-person interviews with semi-finalists for the position of HHS dean and selected four finalists to visit campus. Faculty and staff are encouraged to participate in the interview process by attending the open forums and receptions. The finalists will provide a 15-20 minute presentation on challenges and opportunities facing Schools of Health and Human Sciences, particularly UNC Greensboro, followed by a question and answer session. Candidate 1: Monday, October 22, 2:15-3:30 pm, EUC Alexander Room, reception to follow in EUC Claxton Room. Finalists names and CVs will be made available four days before each visit. A video recording and survey will also be posted after each open forum. All information can be accessed at https://sites.google.com/a/uncg.edu/hhs-dean-search/. Explore the past through history and archaeology. Saturday, Oct. 20, come to a family-friendly, hands-on event at the Greensboro History Museum LeBauer Park terrace. The event will run from 11 a.m. to 3 p.m.
See remote-sensing in action. Check out fossil casts. Enjoy lots of kid-friendly events. Meet and talk with UNCG archeaologists and city historians. The event is free-admission. It will be held rain or shine. It is sponsored by the UNCG Archaeology program, the Greensboro History Museum and the City of Greensboro. UNCG Online: The Division of Online Learning facilitates this annual award to honor a faculty or staff member who has demonstrated excellence in developing, supporting, and/or teaching of online courses and programs at UNCG. The objective is to showcase outstanding teaching and to recognize development and support efforts that create engaging online learning experiences. The ultimate goal of this recognition is to promote innovation and improve the quality of UNCG online courses and programs. ● Faculty and staff members can be nominated for online teaching, development, and support activities conducted in the 2018 calendar year. Self nominations are accepted. ● Students, staff, faculty or administrators can submit a nomination. – A letter of support from the nominee’s department chair, Dean, or direct supervisor. – Peer evaluations (maximum of 3) and course and instructor evaluations (maximum of 3). Please attach as a Word or PDF file. Nominations should be submitted to Nichole McGill, ntmcgill@uncg.edu, no later than November 10, 2018. The award winner will receive an honorarium of $3,000. Those with questions may contact contact Jim Eddy, Dean, The Division of Online Learning, jmeddy@uncg.edu. Don Wright, a member of UNCG’s division of Information Technology Services for more than 30 years, died last weekend. He received a BS in political science and economics from Western Carolina in 1976 and a Master of Public Affairs degree from UNCG in 1982. He began his career at UNCG in 1984. “Those of you who knew Don well know that he was a gentle, sweet man, who extended his kindness to everyone,” Vice Chancellor Donna Heath said in a note to her ITS colleagues. Arrangements are being coordinated via Lambeth-Troxler Funeral Service. A celebration of life for Don Wright on will be held Monday, October 22, 2-4 p.m. in the Alumni House’s Virginia Dare Room. If you have any pictures of Don, please email them to Michelle Griffin. Barbara Chadwell, director of prospect management and research in University Advancement, is the 2018 recipient of APRA Carolinas’ “Professional of the Year” Award. APRA Carolinas is a chapter of the Association of Professional Researchers for Advancement (APRA). Chadwell has been a member of APRA since 1989 and a member of the APRA Carolinas chapter since 1994, having served as a past board member for five years, a vice president for three years and a mentor to numerous members over the years. She is also a member of the Association of Advancement Services Professionals. Prior to joining UNCG in 1993, she started her advancement career at St. Andrews College in Laurinburg, N.C. At St. Andrews, she was director of donor research and then director of development for corporate and foundation support. The JSNN Dean Search Committee, Provost Dunn and NC A&T Provost McEwen recently held confidential in-person interviews with semi-finalists for the position. Two finalists were selected to visit campus. Faculty and staff are encouraged to participate in the interviews by attending the candidates’ open forums and receptions. They will provide brief remarks at the forums followed by a question and answer session. Tuesday, October 23, from 3-4:15 p.m. in the JSNN Auditorium, 2907 E. Gate City Blvd. Tuesday, October 30, from 3-4:15 p.m. in the JSNN Auditorium, 2907 E. Gate City Blvd. A brief reception will be held immediately after the open forums in the lobby area. There’s no blues like the Spartan blues. The Greensboro Transit Authority launched a mobile concert series aboard its HEAT buses last week, and Chancellor Gilliam was the first performer. He was joined by double bass player Steve Haines (who directs the jazz studies program), guitarist Logan Butler and vocalist Jessica Schneider. Several UNCG students also brought Spartan spirit to the ride around Greensboro. It was very popular on social media, helping build buzz about UNC Greensboro. The Open Enrollment period runs from September 29 to October 31, 2018. You will enroll for both your State Health Plan and your NCFlex benefits. Your new elections will go into effect January 1, 2019. To access the enrollment portal’s Single Sign-On page, click here to visit the Human Resource’s Open Enrollment webpage. Click here to sign up for an Open Enrollment workshop. 1. If you are enrolled for health coverage under the State Health Plan, you and your eligible dependents will be automatically enrolled in the 70/30 Plan. If you want to enroll in the 80/20 Plan, you must actively enroll through eBenefits during Open Enrollment. 2. If you want to reduce your premium under any of the plans offered by the State Health Plan, you MUST complete your tobacco attestation by October 31, 2018 ($60 monthly credit). 3. The Flexible Spending Accounts (FSAs) require re-enrollment every year. • The 2019 Health Care FSA maximum annual contribution limit is $2,650. • The 2019 Dependent Day Care FSA maximum annual contribution is $5,000. Any unused Health Care FSA funds in your account at the end of the calendar year, up to $500, will be rolled over into the next plan year as long as you have a minimum balance of $25. • There is no increase to premiums for 2019. • The 80/20 Plan’s out-of-pocket maximum has changed from a separate medical and pharmacy out-of-pocket amount to a combined medical and pharmacy out-of-pocket maximum. • There has also been a change in the 80/20 Plan’s specialist and inpatient hospital copay. • The co-pay reduction offered under the 80/20 Plan for Blue Options Designated specialists and hospitals have been discontinued. • The tobacco attestation premium credit activity has changed for tobacco users who want to reduce their monthly premium. Now, tobacco users must commit to visit a CVS Minute Clinic for at least one tobacco cessation counseling session within 90 days after the last day of Open Enrollment or risk losing the monthly premium credit. Click here to review more detailed information about 2019 benefit options. • Premium rates for Critical Care Insurance are lower in 2019. • The annual contribution for the Health Care Flexible Spending Account (FSA) is $2,650 for 2019. • You may enroll in or increase your Cancer Insurance coverage without providing Evidence of Insurability (EOI). To learn more about your options, visit www.shpnc.org for information about your health benefits and www.ncflex.org for information about your NCFlex benefits. Please contact the HR Benefits Office at (336) 334-5009 or askbenefits@uncg.eduwith any questions.